People travel for all kinds of reasons. Whether you're taking a much-needed vacation, going out of town for a business trip or seeing a concert, you may be looking for a hotel to book. Travelers consider several aspects before booking a hotel — location, amenities and price are just a few. Below, we'll talk about three different types of hotel guests and what they look for in a hotel. Tourists are from out of town and want to experience a new place to the fullest, but what do leisure and tourist travelers want in a hotel? A tourist will want to go sightseeing and do other activities in the area. So, there's a good chance that they'll want a package that bundles their hotel room fees with passes and tickets for attractions in the area. Packages like these are great for tourists because they can do everything they want and still save some money. When you book at the Warehouse Hotel on the Spooky Nook Sports property, you'll have the option of choosing a Stay & Play package. These packages include great rates on the rooms and tickets to local attractions, like Hersheypark and the Sight and Sound Theater. Business people go out of town for conventions to learn about new trends in the industry, develop relationships with future clients and more. They also travel very differently than people who are traveling for pleasure. So, what are some hotel features business travelers look for? A person traveling for business may be looking for a hotel that has a room where they can hold a conference or meeting. Whether it will be a big or small gathering, they may need somewhere to give presentations and hold luncheons. This type of hotel guest will also need WiFi — preferably free and high-speed — to get work done, whether it's on their own in their room or during a meeting. Many business travelers also look for hotels with a gym or spa so they can get their regular workout in or treat themselves when they have some extra time. These types of travelers aren't exactly on vacation, but they are traveling to attend a specific event. 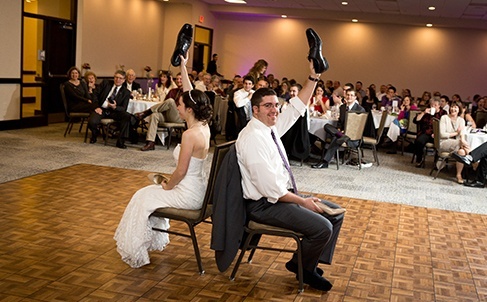 Event travelers can be attending a convention, a wedding or another event like these two. Like business travelers and tourists, they have their own unique needs for their hotel. When they aren't attending their special event, these travelers want to find entertainment and dining that's not too far away from the hotel. If they only have a little bit of time between panels or before a larger event, they don't want to go too far away. Sometimes, their event is happening right in the hotel itself — but when it isn't, they don't want to be too far away. If the event lasts all day, they don't want to get up earlier or stay out any later than they have to. If you're traveling to the Manheim, PA, area for vacation, business or to attend a special event, the Warehouse Hotel is the perfect choice! We have everything you'll need, no matter what type of traveler you are. Also conveniently located on the same property is Spooky Nook Sports and the Forklift & Palate restaurant.